Move over Bio cheese, there’s a new cheese in town. 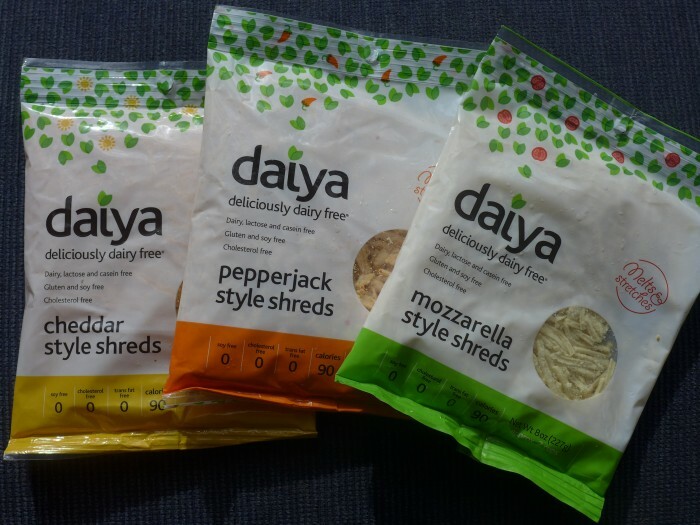 There has been a bit of vegan cheese action in Melbourne recently, with the arrival of the greek fasting Bio cheese, and now daiya. Many people loved the Bio cheese, but I am not a fan. Bio was so promising and I wanted to love it. Unfortunately I am one of the few that experience a weird chemical aftertaste. I must confess that I am not a fan of many vegan cheeses at all. Frankly I think that most are awful, with the exception of Vegusto Piquant, the Botanical Cuisine cashew range and Notzarella. What is missing from those is a melty-cheese-on-toast/macaroni-cheese/cheese-sauce/gratin type of cheese experience. I have found it at last. Daiya is here. I bought mine at the Prahran Convenience Store on the second day it was available, and raced back across town to give it a work out. I bought all three flavours: cheddar, pepperjack and mozzarella. They all come shredded, and that’s fine because this is a melting and cooking cheese, not a cheese platter one. The 227g packs cost $10.50 each. That works out at around $46/kg which isn’t cheap, but it is so good. Firstly I made two types of grilled cheese on turkish bread with the pepperjack and the cheddar. Swoonworthy. The texture is right, the flavour is right. I was so excited I started live blogging the daiya experience on Facebook while I was eating. For dinner I made some macaroni cheese. 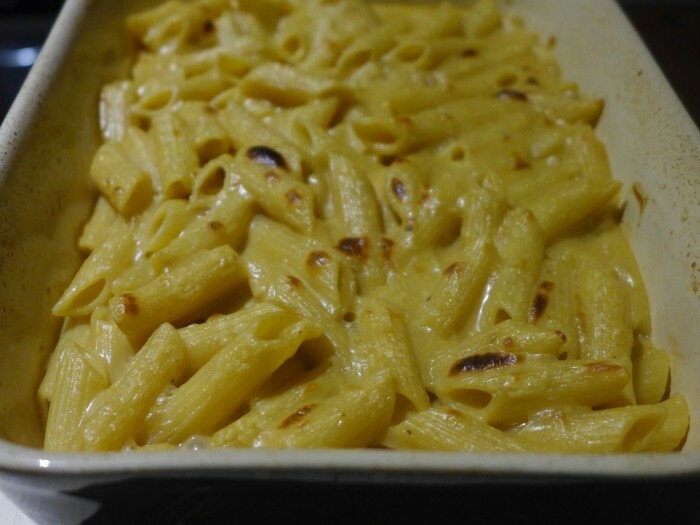 Believe me, I have made every vegan “Best Mac Cheese Ever” recipe. They run the full gamut of awful – fake cheesy flavours, too much savoury yeast, pumpkin, sweet potato, cashew, miso, tahini. I’ve tried them all and they are just wrong, wrong, wrong in both flavour and texture. Every one a disappointment, until daiya. Tomorrow I will take the mozzarella to my local pizza place where they will happily make me a pizza with it. I will report back. It is currently available at Mad Cowgirls, Prahran Convenience, and at the Cruelty Free shop from Monday and probably others soon. If you have been looking for a seriously yummy, melty vegan cheese, look no more. This is it! LOL I understand the forgetting to take photos in excitement! Great review, I’m hoping to pick some up next week assuming they have some left! Mad Cowgirls have just got it in today. Cruelty Free Shop from Monday apparently. And your favourite pizza place? That’s our regular pizza place too, and I’ve never thought of asking them to add a vegan cheese. I just get the potato and onion/pumpkin with no cheese, but with caramelised onion added. Mmmmmm. Perhaps if we all annoy them with our bags of vegan cheese they’ll start stocking it! They offered to do it Linda. They said they would love to offer vegan cheese but that the supply of notzarella has been flaky. I haven’t actually taken them up on it yet as I usually buy pizza on the way home when (despite being a cheese tragic) I am not carrying cheese. So far I have bought them without cheese and then added it at home and given it a quick melt in the grill, And the potato/pumpkin is my favourite pizza from there, closely followed by the mushroom. Your post is really interesting, considering my mozzarella experience. That mac and cheese – and the grilled cheese – look pretty damned tempting. Back to the shops for me tomorrow! Mozzarella is my least favourite of the three. 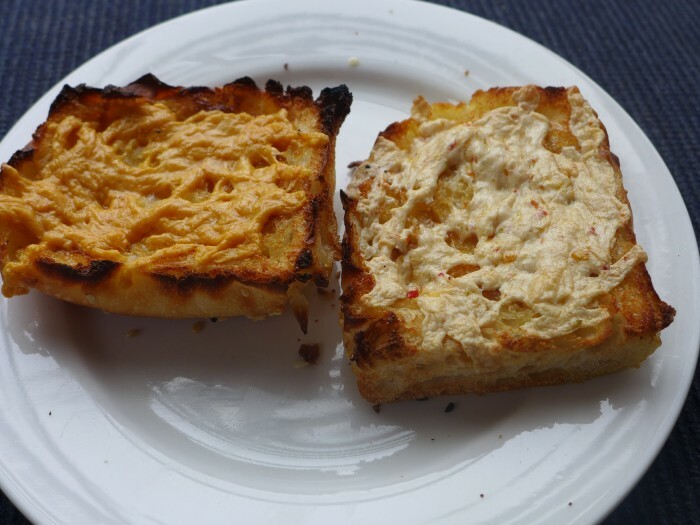 The pepperjack is great in a toasty and the cheddar in mac cheese. I am currently doing a taste test of a pizza from For the Love of Pizza with notazarella and with daiya mozzarella. For science of course. I lived in the US and know Daiya well…Beware most products are made from Palm Oil from Brazil AND have Titanium Dioxide Colour…Disappointing and Super expensive…Surely we deserve better…. Teresa is right. Too bad this product contains palm oil and a chemical you find in housepaint. No thanks. Hi Lauren, actually I have a bag of the cheese in my fridge at the moment (pepperjack) and there is no palm oil in it. This isn’t a health food blog, it is about the enjoyment of vegan food, so the occasional additive will be in the products I use. You are welcome not to eat it. I do occasionally because I loved dairy cheese and just because I don’t want to eat it now, doesn’t mean I don’t miss it.